Robert Pieratt, Civil War soldier, 1862. Today I’m going through old photos that I’ll include in my next book. These are pictures I took in 2002 with my camera, of old portraits that were in my great uncle’s chest of family history. Now—eleven years later— I’m scanning, cropping and figuring out where to put in my book, The Kansas Quilter. As I sort them by family, and study the photos with a magnifying glass, I’m finding clues to my ancestors’ pasts. For example here’s a photo of Robert Pieratt, probably taken when he enlisted in 1862. He died on Feb. 19, 1863—at the age of 17. Here’s how I wrote his death in the letter, Feb. 26, 1863 in Stitch of Courage. Now look at the photo again and think how bittersweet it would be to have a picture of your son as he’s ready to go to war, and then to hear you’ll never see him again. The father, John Pieratt (from Trail of Thread) lost a son on the 19th and his wife on the 20th. Why were these Quilts kept? We had a warm sunny day this week, so I pulled out a tub of quilts I inherited from Lois, my mother-in-law. They had been stored in a cedar chest, made as a high school project by her future husband back in about 1925. I spread a white tablecloth on the driveway and unfolded the first quilt. The double wedding band quilt is a beautiful display of color, stitching, and handwork. The intricate machine stitching alone had to take days to do. The quilt is a real work of art, in perfect shape, probably rarely used except as a display on the bed for when company came. It could have been a wedding present. The second quilt I spread out was almost past the “thread bare” stage, faded from years of use and washings. Scraps of fabric, with no color scheme, just made from what was available. I’m sure it dates back to at least my mother-in-law’s days of growing up in the 1920s- 1930s. Researching the pattern, I’d say it is a Double Quartet quilt block pattern featured in Capper’s Weekly in 1927. They are both machine stitched, with no signature or date on either quilt. Lois was a very practical, organized woman, and never seemed attached to mementos from the past. She only kept and used what she needed. So now looking at this old worn out quilt, I wonder who made it, and why did she keep it. I’m guessing the first quilt was kept because it was a gift, and a treasure due to the workmanship. The second quilt though, even plain and worn out, must have had very special memories attached to it. My writer’s imagination flashes through many scenarios. Was it on Lois’ bed when growing up or on her sister Helen’s bed who died when the girl was a teenager? Made by a grandmother and used by the grandfather that lived with her family. Or, was it just an old quilt used as a picnic blanket in their first car? I’ll never know the history of these quilts since the previous owner is now gone. I’m just guessing they were kept for some special reason besides for display and warmth. I thought of my great grandmother Kizzie Pieratt several times yesterday. It had been 40 years since she died. Besides my having a good memory for event dates, I’ve been working on the Kansas Quilter book series about her life and the quilts she made. I watched the calendar as her death date approached. She and husband Ira were married 70 years, and she lived another seven years after he died. My husband and I have been married 35 years this month­—half the amount that my great grandparents were married. Kizzie and Ira were pioneer children. First generation to be born to my Kansas homesteading ancestors featured in my Trail of Thread book series. I think of all the changes I’ve seen in my life span, and then compare it to theirs. Huge inventions—electricity, telephones, cars, and airplanes, and so much more—were invented during their lifetime. Although Kizzie’s been gone for several decades, I still have items we both touched and used…including her quilts she hand stitched decades ago. Electricity may have changed how we can make quilts, but quilting is still done the same way—with our hands, while thinking of who may touch the quilt in future generations. I love hearing from people that have read my books, and how the real pioneer women portrayed in my historical fiction series have touched their lives. 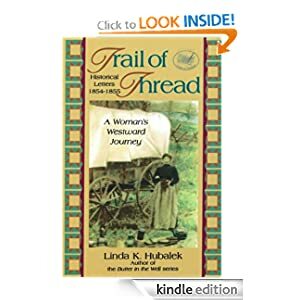 My Trail of Thread series also brought quilters into my reading circle, inspiring them to use the quilt blocks featured in the back of the books for block-of-the-month, quilting clubs, and personal quilt projects. This month a special reader found me through the internet, wanting to show me a quilt she made featuring quilt blocks from the Trail of Thread series. Margie’s mother gave her my book Thimble of Soil because Margaret Ralston Kennedy, the main character in this book, was actually her own great, great, great grandmother. Margie picked out twenty patterns, made the blocks using material that looked old-fashioned and hand-stitched the quilt featured with this blog. She embroidered the quilt pattern underneath each design, and a signature plate on the back. What a great way to commemorate her ancestor, and to have a quilt she has handmade to pass down to her own descendants. Another plus from her email—I found a cousin from my Kennedy family tree because our great, great, great grandfathers (Michael and Hugh Kennedy) were brothers! So please email me a note if you have enjoyed reading my books. It keeps me writing, knowing I have touched your hearts with stories and memories about special pioneering women. Many thanks from the Kansas prairie, Margie…where both of our ancestors lived!